Today I've got a layout I made with the May kits from The Paper Bakery. Both kits have such beautiful papers and embellishments that go together perfectly, so this was a lot of fun to mix and match. I even dug out some of my vintage 70's photos ;) Another layout completed for my childhood years scrapbook. I got my love for jewelry from my Grandma, and just like her, I would choose the eclectic look over diamonds and pearls any day. I love mixing and matching pieces and coming up with new ways to wear them. When a challenge came for the Imaginisce team to create a piece of jewelry, I knew exactly what style of necklace I would make, eclectic and fun! For this necklace, I started by printing the cameo onto white paper. I punched the cameo out using the large Imaginisce paper punch, then used my i-top and Magnet Daddies to make my own custom charm. 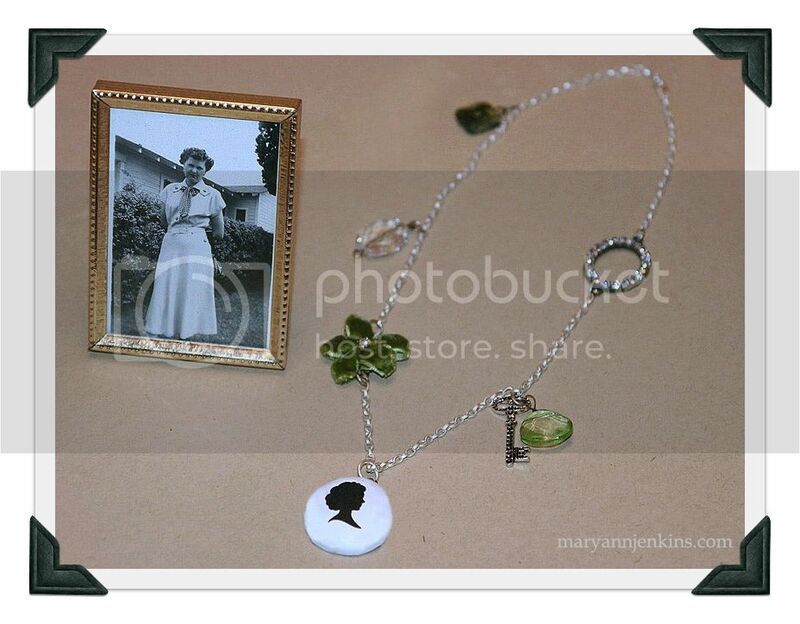 I added the cameo charm to the necklace, then added bits and baubles here and there for a one of a kind necklace. Be sure to stop by the Imaginisce blog this week to see all the other ideas the team has come up with and be entered to win a Magni-top jewelry package! Today is my friend Sarah's birthday, and all of us on the Paper Bakery design team, (and Sarah's sister too!) decided we wanted to SURPRISE her with a Birthday Blog Hop in honor of her special day! I first met Sarah online last year through her fabulous kit club. Since then we've been able to get together for dinner and do a little scrapbook shopping when she was visiting CA earlier this year. Needless to say I had a great time, and now call her my friend. Now hop on over to Erin's blog to see what surprise she has for Sarah!! Also, we are doing a giveaway of a $10 gift card to the Paper Bakery, so be sure to leave a comment on each and every blog!! Here's the list of all the blogs in case you get lost ;) We will draw a winner Wednesday night! Mary Ann's Blog ----> that's me! Oh, and as an extra surprise, I am doing my own little giveaway here on my blog of these fun embellishments from Little Yellow Bicycle. Remember to leave a comment! Surprise and Happy Birthday Sarah! Before I show you the cute project I made for Teacher Appreciation Week, I just want to thank all of you for the sweet comments about my Mom-in-law. She had her first round of chemo, and now a week later, the related symptoms are subsiding. All in all, I think she did pretty good. It's going to be a long summer for her and my dad-in-law, but she's a fighter and I just know in my heart she's going to be ok. Thanks for your continued thoughts and prayers. It's Teacher Appreciation Week over on the Imaginisce blog, and here's my fun project that I had to share. I saw something similar to this a few years back, and thought it was such a great idea! It doesn't take much time to create and was perfect for this year especially since my son has a male teacher so it's not too cutesie or feminine. Be sure to check out the Imaginisce blog for even more great ideas! She's got a long road ahead and there are still so many unanswered questions about her prognosis. Today I've got 3 projects to share with you, all made with the super cute and brand new "Hello Cupcake" collection from Imaginisce! I used the 6x6 paper pad, and cut 3 pieces of paper into a triangle shape and 2 into a banner shape. The die cuts are perfect to add as embellishments, along with some tulle and ribbon. I enlarged a photo to be front and center and made my own little banner using patterned paper, cardstock and twine. Finally, a birthday card that was quick and easy to put together with a few left over scraps, and sticker stackers! 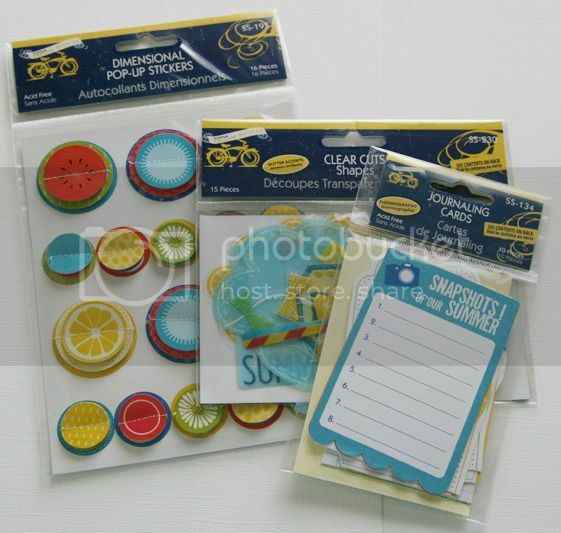 Be sure to stop by the Imaginisce blog for even more inspiration, and a chance to win a "Hello Cupcake" collection pack!! I did some fussy cutting on the doilies, used foam tape for a little bit of dimension and added my favorite quote. A quick and easy layout, but I love it! All this week Canvas Corp is teaming up with Imaginisce to bring you some amazing inspiration!. There are great prizes to win at both blogs, so be sure to stop by! For my project, I made this sweet little shadow box for my Mom. Back in the 40's, Gene Autry was the "singing cowboy movie star" that everyone loved! My Mom still likes to tell the story about the day she and her sister got to meet him and have their picture taken with him. This is such a treasured photo to her, I knew she would love this remembrance of that special day. To start, I gave the shadowbox a light coat of white paint. After it dried, I sanded it just a bit so some of the original brown color would show through. I cut the burlap square to fit, and hot glued it inside the shadowbox. Next I stitched around both canvas stars with embroidery floss. I then added the red canvas flower, a canvas star, a denim roly rosie and an i-top button covered with burlap. I hot glued the rope and the other canvas star before adding the photo. I finished by adding journaling strips. Don't forget to check out the Canvas Corp blog and the Imaginisce blog for a chance at the giveaway! Hi and welcome to the Paper Bakery Washi Tape Blog Hop! Oh, and Happy National Scrapbook Day too! If you have arrived at my blog first, be sure to go back to the Paper Bakery blog to start. 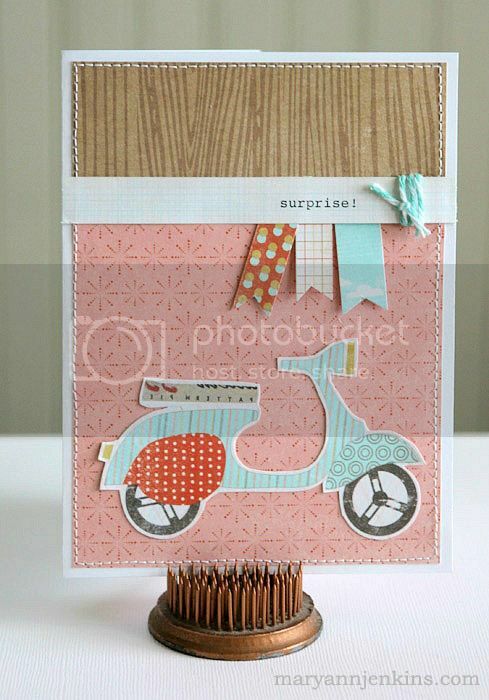 For our blog hop, all of us on the Design Team are showcasing a project using Washi Tape. What started out as just a few rolls, has now turned into a full on obsession for me ;) wink wink. Now if you are saying, "hey, what the heck is this washi tape anyway?" Here is my layout for a bit of inspiration. Next on the hop is Angie's blog. Head on over to see what she has to share! Be sure to comment on each blog for a chance to win a fabulous prize from the Paper Bakery!!! I'm doing my own little giveaway too, become a follower and leave a comment letting me know you did, or that you already are, and I'll draw a name Sunday night for 2 rolls of fabulous washi tape!!! Today I have a card to share! I made this using the April add-on kit from the Paper Bakery, and the best part, I even used the cute little brown bag that embellishments in the kit come packaged in! 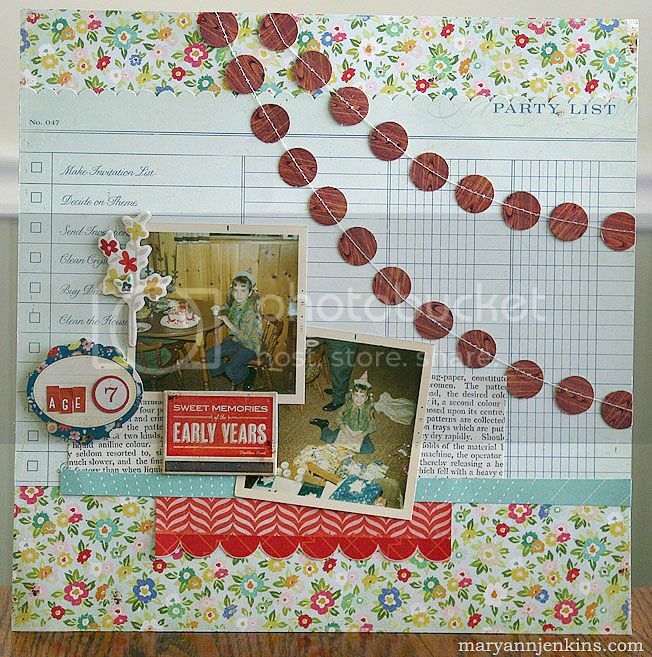 I've got another layout to share today that I made for Scrapbook Daisies. This one uses the new Fresh Squeezed collection from American Crafts. This was such a easy and fun layout to make! I measured where I wanted the openings to be, then used a craft knife to cut them out. I did some machine stitching around each opening, added the large photo and papers to the back, then added more photos and embellishments to the front. I love how it turned out! This is probably the 10th layout I've made of Gracie at the park, but considering we go to the park at least twice a week while everyone else is at school or work, I guess that's not too bad ;) She loves playing at the park, and this momma loves watching her play at the park even more.